Collisions at intersections are as common as they are dangerous. Two drivers entering an intersection may collide head on or may side swipe each other at great speeds causing severe injuries and substantial vehicle damage. Many of these crashes are broadside collisions where there is little metal or cushion between the driver and the oncoming vehicle. If you’ve been the victim of an auto accident at a busy junction or intersection, then you know how devastating the crashes can be. What Type of Intersection Accident Cases Lead to Big Settlements and Verdicts? How Serious are Accidents at Junctions or Intersections? Auto accidents that occur at intersections and junctions account for a large portion of all of this country’s auto accidents. Although the rules of the road dictate otherwise, motorists run red lights, proceed through stop signs, and speed through intersections on a daily basis. The statistics behind these collisions are evidence of this. Consider that 43% of all auto accidents occur at an intersection or junction. Also consider that 21% of traffic-related fatalities can be attributed to a collision at an intersection or junction. 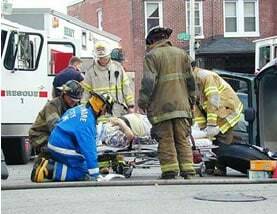 Further, nearly half (49%) of all accidents that occur in an urban setting, such as Baltimore or the D.C. metro area, occur at intersections or junctions. Clearly, these types of accidents pose a serious risk to traveling motorists. Which Chain Reaction Collision Cases Lead to The Largest Payouts? David proceeds home from work as he always does, leaving the new Inner Harbor East and driving down I-83 towards the Baltimore Beltway. He gets to Bellona Avenue in Towson. The first few traffic circles have clear stop and yield signs that indicate to David and the other traveling motorists if and when they should stop to allow vehicles to pass in front of them. David seamlessly passes through the first three intersections, yielding for traffic that has the right of way, and stopping at all appropriate stop signs. As David nears the fourth traffic circle, he notices that it is different from the previous three. It only has one stop sign and no yield signs. That leaves three lanes of traffic relatively unregulated, and leaves motorists free to drive through the traffic circle at the speed and in the order they so choose. Seeing no stop signs or yield signs, David makes a slight right into the traffic circle without looking left. As David enters the circle, he is struck from behind by John, who is also on his way home from work. The cars collide and, while David is uninjured, John has a broken neck and is airlifted to a nearby hospital. Arguably there are two at-fault parties here. The city or county in charge of maintaining the roads to ensure the safety of traveling motorists can be held liable, because they negligently failed to place yield and stop signs at the traffic circle. Also, David may be liable because, even though there weren’t signs directing him to stop, he should have been more careful. Here are examples of jury awards to victims in intersection cases. Have you been involved in a collision at a junction or intersection? If so, Miller & Zois are a team of attorneys that can help you. 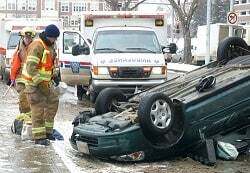 Our track record in intersection crashes and in car crash cases in general gives us the kind or resume few can match. Please contact us at 800-553-8082 or get a free case evaluation online.